These “American” foodies are trying Filipino Street Foods here on a BuzzFeed video. It comes to no surprise that they seem somewhat amused. Filipino-Americans already know what kind of foods that those born and raised here in the states are used to. So it’s always fun to watch their shock and amazement while they are confronted by something so foreign as Filipino street food. Maui Friday Town Parties happen every Aloha Friday! Hosted by the Maui County Office of Economic Development, each 5 Friday night party highlights one of Maui’s historic small towns and along with their unique, local businesses. Whether it’s an eccentric art show in Lahaina or a paniolo party in Makawao, each town creates an authentic atmosphere including great local food, amazing local music, and local arts and crafts vendors to name a few. 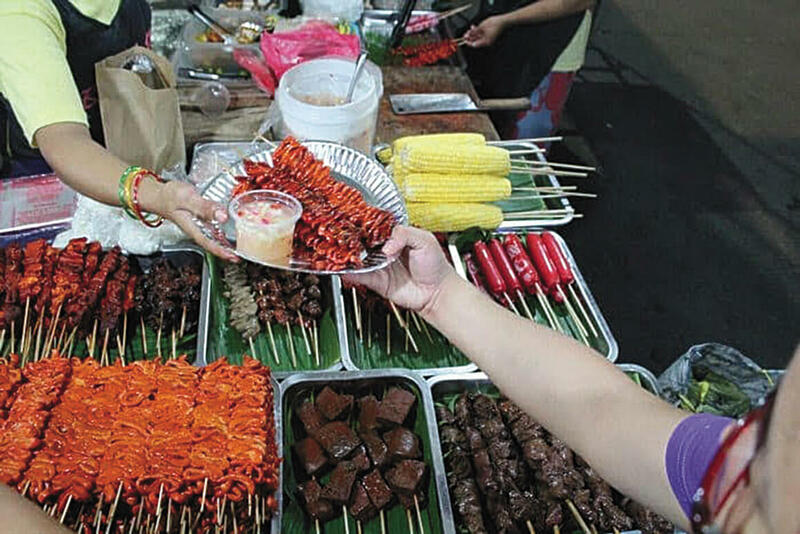 Top Ten Filipino Street Foods are reflected here in the hustle-and-bustle in the heart of Manila. Both residents and visitors greet every Friday pau hana with a special night of Maui’s culture of aloha, highlighting incredible food and free entertainment. One of my personal favorites to go to is Wailuku’s First Friday, due to its numerous local Filipino Food Vendors. I tend to see a lot of familiar food enthusiasts walking happily and content with sometimes a take-out food in brown bags. Street Foods are ready-to-eat food or drink sold by a vendor on the streets in big cities, small towns or in other public places, such as at a market or fairgrounds. But, what is Street Food? If one might ask? Well, here it is… Street Food is ready-to-eat food or drink sold by a vendor on the streets in big cities, small towns or in other public places, such as at a market or fairgrounds. It is often sold from a portable food booth, food cart, or even a food truck. They are meant for convenience and immediate consumption. Some Street Foods are regional but can also spread beyond the region of origin. Most Street Foods are classed as both finger food and fast food and are cheaper on average than restaurant meals. Based on a 2007 study from the Food and Agriculture Organization, 2.5 billion people eat Street Food every day. Yes! It is to experience local, regional, and ethnic cuisines. Yes! It is cheaper than a restaurant meal. Yes! It is ready-to-eat, and it’s easy to eat. Yes! It usually has big and bold flavors. smells wafting around you as you wait for your order or dig into a meal. And yes! It definitely is a very nostalgic experience. Seasoned travelers know that to get a genuine feel for the pulse and energy of their destination, a meal on the streets is a good place to start. And in recent years, Street Food has become so popular that now, everyone wants to take part in the experience. 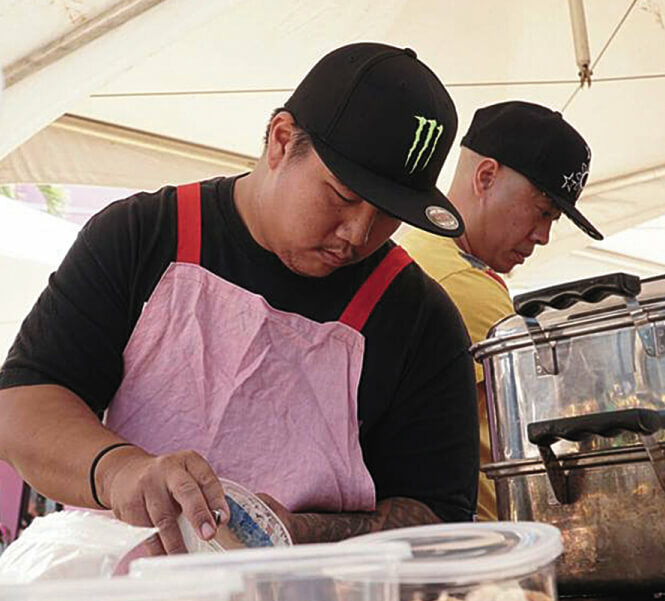 Gemsley Balagso—of Westin Nanea Ocean Villas—will return this year to defend his title of Master P-Noy Chef®. I love Street Food but I’ve never been able to eat it without ending up hot, sticky, and sweating—because often times, it is outdoors and you are surrounded with hundreds of hungry bellies jumping from one vendor to the next. Jonathan Pasion of Ka‘ana Kitchen from the world famous Andaz Maui Resort is fierce competitor number one. Three chefs will compete for the coveted title 2018 Master P-Noy Chef®! Last year’s champion, Gemsley Balagso will defend his title against two fierce competitors: Jonathan Pasion of Ka‘ana Kitchen from the world famous Andaz Maui Resort, and well seasoned chef, Jason Carpio of the beautiful Wailea Marriott Beach Resort. Whose cuisine reigns supreme? Come and find out! The Master P-Noy Chef® Cook Off will begin at 11 a.m. in front of the stage and the 2018 Master P-Noy Chef® will be announced at approximately 12:30 p.m. It is a friendly competition but to keep the camaraderie suspenseful and exciting, a Mystery Basket of ingredients will be unveiled at the start of the cook-off. 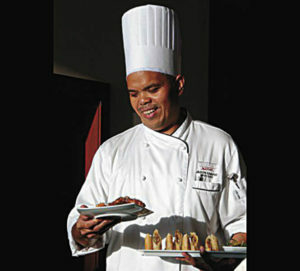 Jason Carpio , also a well-seasoned chef is the second fierce competitor, coming from the Wailea Marriott Beach Resort. 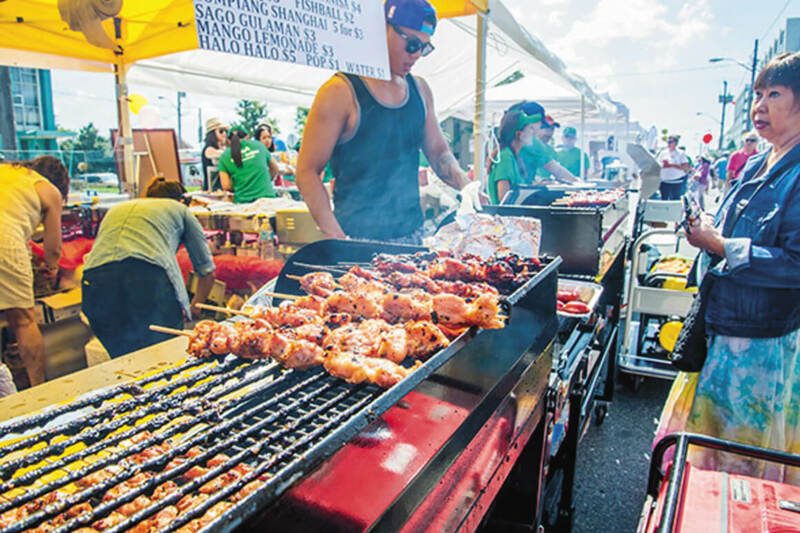 What is better than celebrating Filipino-American History month in October than highlighting Street Foods? The event is packed with lots of entertainment and food vendors. Food Scripts are available to be purchased in advance, contact me today at (808) 283-6358 to get yours! Come and join the fun! Fishballs – an edible, ball-shaped patty made of pulverized fish. These fish meatballs are primarily white or yellow in color, and measure about an inch to two inches in diameter. They are made by pounding rather than grounding and have a very different texture to Western meatballs. These balls are a staple of Chinese cooking and are used in a wide array of dishes. Proben – One of the deliciously tasting Street Foods in the Philippines is the Chicken Proben. Proben is essentially the proventriculus part of the chicken, which is dipped in cornstarch and then deep-fried. 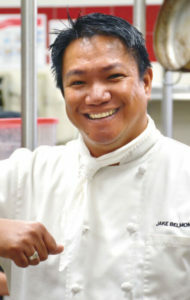 Chef Joaquin ‘Jake’ Belmonte, Jr. is a Culinary Lecturer at the UH Maui College, Culinary Arts Program. 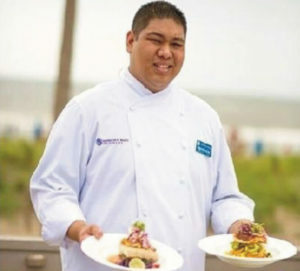 Belmonte was graduated from Maui High School and worked extensively in the Food & Beverage operation in the hotel industry. He is currently the Chef Representative of the Blue Zones Project – Central Maui Restaurants & Grocery Stores, a Facilitator of Hawai‘i National Great Teachers Seminar; and an active member of the American Culinary Federation. Belmonte was recognized by the Hawai‘i Hospitality Magazine as one of the 2008 Top 10 Rising Chefs of Hawai‘i under 40 and was the 2009 Chef Representative of the Hawai‘i Visitor and Convention Bureau’s West Coast Marketing Campaign. Happily married with two children, Belmonte is also a Small Business Owner and Operator of Maui Lifestyle Healthy Choice, a premier healthy vending company. Kwek Kwek – These Street Foods are hard boiled eggs with an orange colored batter coating and cooked deep fry. Another version of it is Tukaneneng, using quail eggs instead of chicken eggs. These foods are served with cucumber and some spices, of which you can choose to top it with vinegar and salt. Taho – It is a soybean snack with sweet syrup and tapioca pearls. Taho is one of the favorite breakfasts and snacks of children and adults. Banana Cues – Also known as Maruya, these foods are the Saba variety of bananas that are coated with caramelized sugar, deep fried and speared to bamboo sticks. Chicharon – These are cracklings made from different parts of chicken and pig. They are seasoned and deep fried. Just the smell of these cracklings would make you want to buy it. Chicharon Street Foods include Chicken Skin (made from the skin of the chicken), Chicharong baboy (from pork rind), Chicharong Bituka (from chicken and pork intestines) and Chicharong bulaklak (from Pork Omentum). Barbeque – These are marinated chicken and pork parts, speared in bamboo sticks and grilled. Barbeque varieties include Betamax (dried chicken or pork blood), Adidas (chicken feet), Helmet (chicken head), and Isaw (chicken intestines). Kutsinta – native rice cakes usually sticky. They are topped with grated coconut and sugar. Buko Juice – refreshing buko juice mixed with evaporated and condensed milk. Balut – a hard boiled duck egg with a developed embryo.